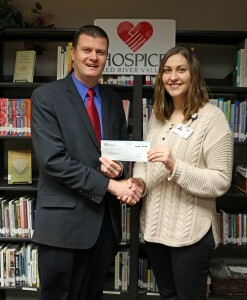 This week Justin Forde, director of public affairs for Midco​, presented Stephanie Pritchard, a bereavement specialist at Hospice of the Red River Valley​, with a $1,000 check. This donation will be used by our bereavement specialists to help those in need of grief support. Thank you, Midco, for your generosity!